Agnieszka qualified as DVM from University of Life Sciences in Warsaw, Poland. Soon after graduating, in May 2005, she started to work for first opinion small animal practice in Warsaw, gaining specialist knowledge and experience in treatment of exotics. 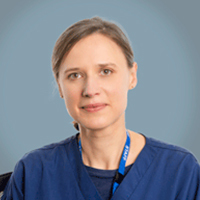 Year later, in 2007, Agnieszka has moved to the UK to pursue career as a general practitioner in a small animal practice. She found her place in very busy small animal surgery in Hinckley, where she spent many wonderful years, gaining experience in many disciplines of veterinary medicine and developing special interest and passion for surgery. She has completed many surgical courses which helped her develop advanced skills in surgery. She had the pleasure to learn from world class tutors and practitioners in the field. Agnieszka’s ambition is to achieve advanced qualifications in the surgery and she hopes that undertaking internship at SCVS will help her achieve her goals.